This device can be placed in a car to alert parents/authorities if a child is left in a hot car. Inspiration: We wanted to build something that incorporates hardware and challenges us, while provides a benefit to people. Hearing stories on the news every summer about children and pets suffering from heat stroke due to being left in vehicles made us want to do something to help. What it does: This device can be placed in a car and connected to the computer system to monitor the temperature and sound in the vehicle. If the temperature is too high and loud sounds (e.g. crying/barking) are detected, a loud buzzer plays to alert nearby people and an SMS message will be sent to whatever numbers are programmed in. How I built it: We put temperature and sound sensors on an Arduino along with a buzzer. 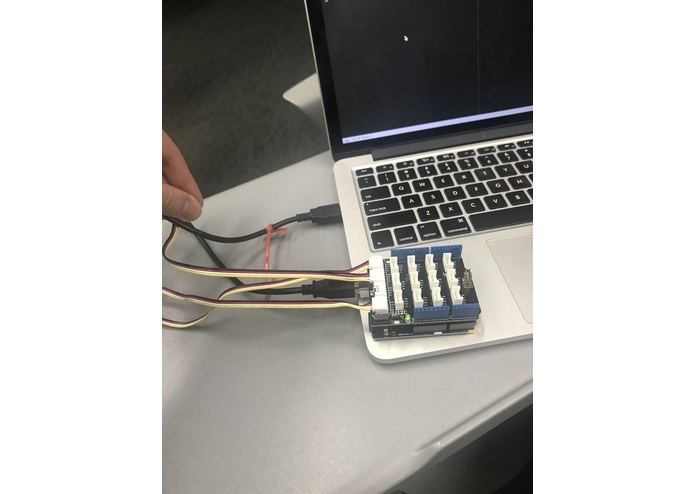 Using the Arduino IDE, we created the program that dictates the sensor and buzzer behavior and linked in via Serial output to a python script. This python script used Twilio's API to send alert text messages to pre-programmed numbers. Challenges I ran into: Generating ideas was a challenge at first, but once we figured out our idea things went smoothly until we tried to link the Arduino program to the python script. Both programs work perfectly individually, but linking them together is very tough. Accomplishments that I'm proud of: We got stuck for almost 8 hours on the previously mentioned challenge but still persevered and brainstormed a plethora of solutions. I'm proud of our ability to create unique solutions, even if they didn't work out. What I learned: I developed problem solving skills even more and got more experience with Arduino. What's next for BabysNotHot: A full working model of our device could be used in smart cars and become another life-saving implementation of IoT.